So last night we met my Mom and Step Dad for dinner because they were bringing Jon back to us from Dayton. We met at P.F. Chang’s since they have a great gluten-free menu and we had a gift certificate and a free appetizer coupon. We ordered the gluten-free lettuce wraps for an appetizer. The waiter was very knowledgeable about the menu and made sure to bring out the gluten-free soy sauce for us. The lettuce wraps were amazing. I tried to get a picture, but it didn’t come out. For the main course I ordered the Singapore Street Noodles and Snow Peas with Garlic. Jon ordered Philip’s Better Lemon chicken with no lemon pieces (LOL) and his broccoli on the side. God forbid the broccoli have the sauce on it. Then he says he didn’t like the taste of the broccoli. Well, duh….it is plain, steamed, un-seasoned broccoli. Needless to say, I took the broccoli off of his hands and added it to my dish. 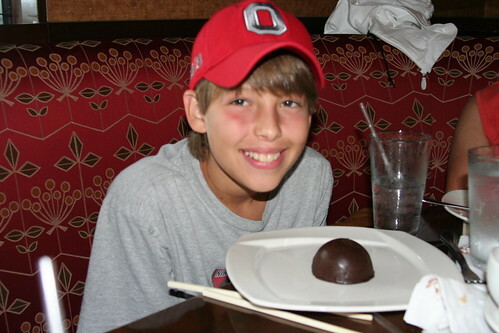 For dessert Jon ordered the Flourless Chocolate Dome (sans raspberry sauce, berries & cream ~ Silly boy!). I had a couple bites….YUM!!! Gotta love being able to call and get Chinese take out. That is one thing I have really missed since going gluten-free. I still have yet to find a GF egg roll, but I will take what I can get. Last night on the way home from King’s Island I was really tired and couldn’t fathom cooking & cleaning up, so I suggested Pei Wei Asian Diner for dinner. Pei Wei is run by P.F. Changs. Convenienty I keep a carry-out menu in my glovebox. I love the Pei Wei Spicy Chicken or the Pei Wei Spicy Chicken salad. Jon really likes the Pei Wei Sweet & Sour. Some locations even carry gluten-free soy sauce, you just need to ask for it. I keep La Choy Soy Sauce at home for when we get Chinese take out. It is like heaven on earth. We really like P.F. Chang’s too, but there really isn’t one close by to our house. Not only do they have a pretty extensive GF menu, they have an amazing dessert too. It is a flourless chocolate dome. Whenever we go we have to get more than one b/c Jon doesn’t really like to share his dome. 🙂 I don’t blame him. It is one of the few places he can safely order dessert out. I have tried many of the items on P.F. 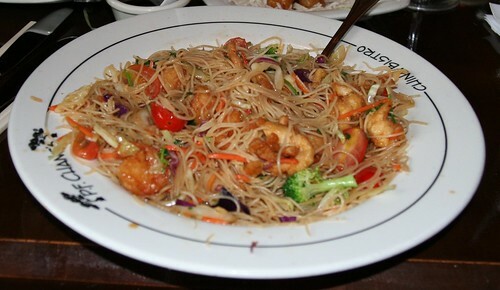 Chang’s menu, but really like the Singapore Street Noodles the best. Some of the other good dishes are Philip’s Better Lemon Chicken, Ginger Broccoli, Chang’s Spicy Chicken and don’t forget the lettuce wraps. They also have gluten-free soy sauce, just make sure to ask your server to get it from the back, the soy on the table is not GF.